Market Society provides an original and accessible review of changing conceptions of the market in modern social thought. The book considers markets as social institutions rather than simply formal models, arguing that modern ideas of the market are based on critical notions of social order, social action and social relations. 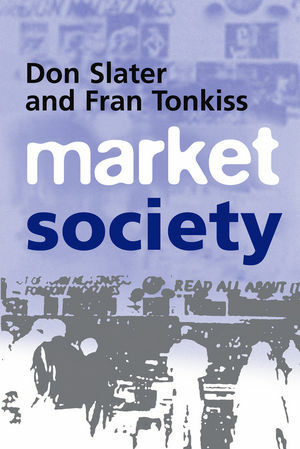 Examining a range of perspectives on the market from across different social science disciplines, Market Society surveys a complex field of ideas in a clear and comprehensive manner. In this way it seeks to extend economic sociology beyond a critique of mainstream economics, and to engage more broadly with social, political and cultural theory. The book explores historical approaches to the emergence of a modern market society, as well as major approaches to the market within modern economic theory and sociology. It addresses key arguments in economic sociology and anthropology, the relation between markets and states, and critical and cultural theories of market rationality. It concludes with a discussion of markets and culture in a late modern context. This wide-ranging text will be of interest to undergraduate and postgraduate students in sociology, economic theory and history, politics, social and political theory, anthropology and cultural studies. Don Slater is Senior Lecturer and Fran Tonkiss is Lecturer in Sociology at Goldsmiths College, University of London. 1. The Emergence of Market Society. 2. Markets and Economic Order. 3. Rationality, The Individual and Social Order. 4. Markets and Social Structures. Conclusion: Markets versus Market Society.